People take photos at the iconic Galata Tower, illuminated in Turkish flag colors, in Istanbul, July 30, 2016. Some signals from President Recep Tayyip Erdogan's administration show no letup in reprisals following an abortive coup attempt two weeks ago. Two weeks after an abortive coup attempt in Turkey caused an upheaval in military ranks and throughout much of the government, President Recep Tayyip Erdogan may be slowly easing some of the purges instituted since rogue members of the armed forces plotted to overthrow him. Other signals from his administration, however, show no letup in post-coup reprisals. More than 750 soldiers arrested since the coup attempt are being released, state media reported Saturday. Another 231 members of the military remain in custody, however. And another 1,700 military personnel have been expelled — dishonorably discharged — since July 15, when a faction of the military commandeered tanks, helicopters and fighter jets and attempted to take over the government. Also Saturday, 60 employees of the Constitutional Court were suspended. The measures taken at the country's highest court will remain in effect until the employees' possible links to the coup attempt are assessed, the court said in a statement. Eight other employees had already been dismissed and were detained July 18. Clashes during the short-lived coup bid killed more than 235 people and wounded nearly 10 times that many, but the major impact of the attempt to remove Erdogan has been the wave of detentions, firings and suspensions. In addition to sweeping purges in the military, more than 66,000 public sector workers have been removed from their positions, two-thirds of them from the educational system. Through Saturday, Erdogan said, 18,699 people have been detained in connection with the coup attempt, and 10,137 have been placed under arrest, meaning they have been charged with criminal acts. About 3,500 have been released. FILE - Turkish soldiers detain Staff Sergeant Erkan Cikat, suspected of being involved in the recent coup attempt, in Marmaris, Turkey, July 25, 2016. Turkey's Western allies condemned the coup as soon as it occurred, and have restated their support for Erdogan repeatedly since then. However, as the purges expanded, the allies also have become concerned about the scale of the crackdown. Erdogan has responded sharply to any perceived criticism from abroad this month. Speaking from his presidential palace Friday evening, he accused the West of deserting Turkey in its hour of need: "Some people give us advice; they say they are worried. Mind your own business! Look at your own deeds!" Erdogan indicated some of his future plans in a wide-ranging interview Saturday with the private Turkish news channel A-Haber. He announced parliament would soon receive "a small constitutional package" that would bring the country's National Intelligence Organization and the chief of staff of the armed forces under the president's direct control. In a further reshuffle of military affairs, the president said all of Turkey's military training academies would be shut down, to be replaced by a single national defense university. Defense Minister Fikri Isik said Friday that the military academies were expected to face "cleansing." Turkey's military, the second-largest in NATO, has been hard hit by the coup and the ensuing purges, with about 40 percent of all generals and admirals having been dismissed. Those gaps are being filled in slowly; on Thursday, 99 colonels were promoted to general-officer ranks. The internal turmoil comes at a time when Turkish forces are already stretched, facing violence from Kurdish separatists in the country's southeast and from Islamic State extremists along the border with Syria. Military authorities said they killed 35 Kurdish militants early Saturday during an attempt to storm a government base in Hakkari province. FILE - Islamic preacher Fethullah Gulen is pictured at his residence in Saylorsburg, Pa., Sept. 26, 2013. The purges have largely been targeted against supposed followers of exiled Muslim cleric Fethullah Gulen, who has been living in exile in the United States since 1999, well before Erdogan came to power. Although the two men once were close allies, Erdogan has denounced Gulen as the "mastermind" of the coup attempt, and declared Gulen's supporters in Turkey were carrying out his direct orders in the attempted coup. Gulen has denied all charges against him, and Erdogan's critics suggest the president is using his crusade against the elderly exile as a cover for policies aimed at quashing all dissent. 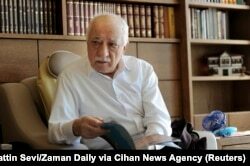 Erdogan has demanded the United States must either hand over Gulen or extradite him to Turkey. Authorities in Washington have said they will review any extradition request, but indicate they will be moved only by clear evidence of the cleric's involvement in an anti-Erdogan plot. A senior Turkish official who briefed reporters Saturday in Ankara, insisting he not be identified, said Turkish intelligence has been intercepting and decrypting messages between Gulen's aides and his network in Turkey for more than a year. The Turkish official said the government identified almost 40,000 of Gulen's followers in the country, including 600 ranking military personnel, by intercepting messages sent through byLock, a cellphone communications application. ByLock claims to use military-grade encryption techniques to ensure secure, private communications of all kinds — text, documents, email and voice-over-internet telephone calls. The app's developer claims that even the firm's own engineers are unable to decipher data sent via byLock.